Lynnette from Oshawa says ..... Just met my cute little neighbour at 12:30 pm. When I said hello, Mr Possum quickly ran away. I didn't even know they were this far north! Vanessa from London, Ontario saw a Possum ..... It was eating cat food on lit porch, was unafraid, kept eating. Then it oddly slithered off steps, oh the full grown poor soul looks wounded! Both back legs were being dragged by front, it slithered into front bush. John from Dundas, Ontario, has seen a Possum, he says ..... We spotted one last night eating some opened peanuts out of shells left for some birds in our back yard. David says ..... I live in Maidstone, Ontario and have a Possum come for supper with the cats. It seems very timid. My wife feeds the cats in the winter and now the Possum. Larry Cahoon wrote to say ..... I found a dead Possum on the side of the road in front of our house, on side Road 7 in Meaford, Ontario. Robert O'Hara from Cambridge reports ..... I set a live trap for a (raccoon?) pest getting into my garbage etc. Instead, this morning, it had a very angry Opossum in it. I released it at a local conservation area. A reader from Ajax, Ontario, wrote to tell us ..... Around 9:00 pm I was watching TV and looked out our patio door to see a creature moving very slowly along our fence. At first I thought it might be a small Raccoon so I turned on the patio light. I couldn't figure out what kind of a creature it was at first and I called my husband and said I think it's Opossum. It had a white face and greyish body and a long pink trail. It spent a lot of time yawning. I was able to see it at close range and found it to be cute in an ugly sort of way. Eventually after about 25 minutes he decided to climb down our Forsythia. I loved seeing this creature up close. One of our readers from Markham said ..... I left the garage door open for a minute to prepare myself to shovel the driveway. When I came back out, I heard some rustling in the corner of the garage. I thought it was nothing until I saw the footprints in the snow. I called out the rest of the family to shoo away this creature. It finally left, very slowly, into the backyard. A reader from Orono spotted a Possum and said ..... Not much to say... It was just exploring our backyard last night. It was cute. 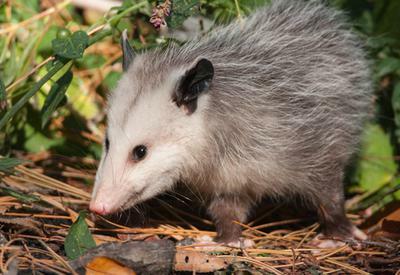 One of our readers from Orageville wrote to say ..... An opossum walked right in front of us across our front path at 22:30 and went under the fence into the neighbour's yard. A reader from Aurora reported ..... Just saw a Possum going through my garbage! One of our readers from Hull, Quebec, wrote to say ..... One appeared in our backyard just now (6:30 pm) in Vieux, Hull, Quebec ! Just across the river from Ottawa. We had to go onto the web to identify it. Maybe it's due to the unusually warm temperatures here this fall - it's still +8C outside right now and no snow on the ground. Thank you all for writing to tell us about your Possum sightings. Yes, they are spreading northward and there seem to be lots of them about. Lets hope that the winter isn't too harsh for them, and that they survive the cold temperatures. I love the expression "..... cute in an ugly sort of way" - that is a great way to describe these little fellas! Join in and write your own page! It's easy to do. How? Simply click here to return to Possum sightings 2014.